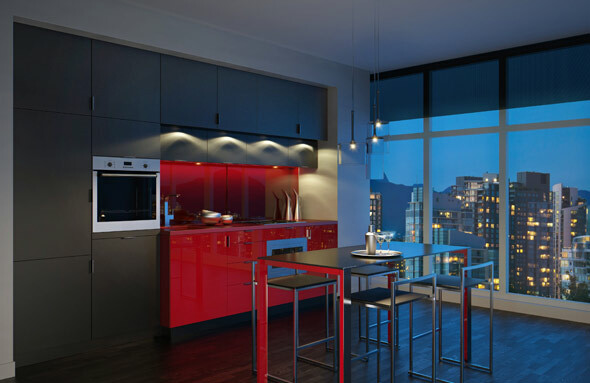 E Condos has been making Toronto's architectural elites drool. 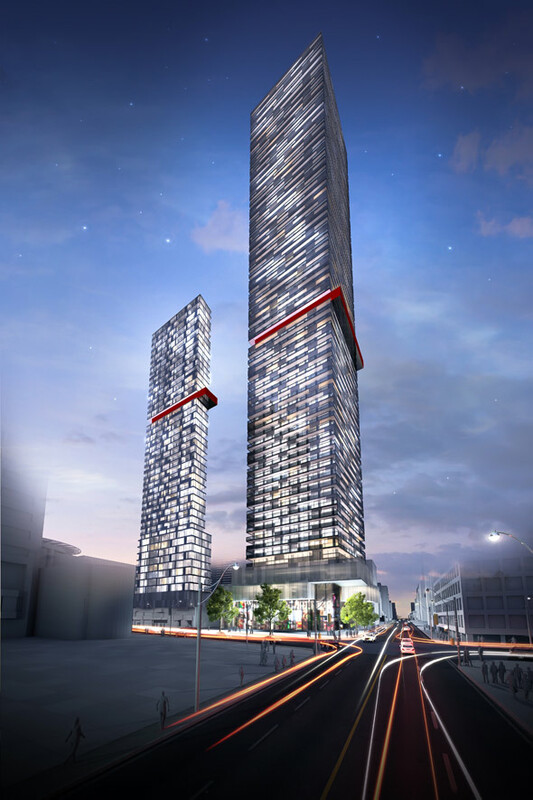 The pre-construction project slated for the northeast corner of Yonge and Eglinton is striking in its rendering phase, most notably by its pair of cantilever pools halfway up of the paired glass towers. Yes, this is the type of thing you see when you sort your Pinterest feed by "Popular." 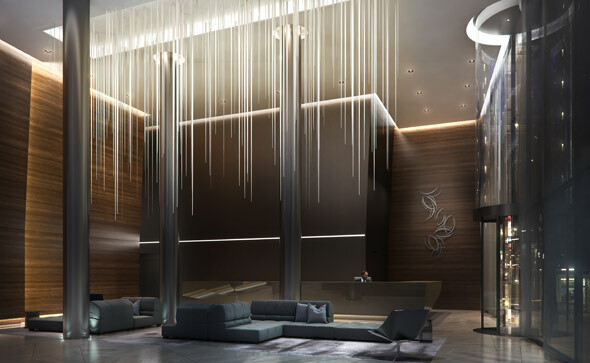 The "eFinity" pools are just some of the many amenities planned for the "E8" and "E15" towers, which still have a long way to go before expected occupancy in 2017. A joint project by Bazis Inc., Metropia and Riocan with TMG Builders on construction, here's a breakdown of the coolest (or, at the very least, the "tallest") thing coming to Yonge and Eglinton. Damn, those pools are cool. As much as I'd love to be a wet blanket and rhetorically ask about the safety of a couple of cantilever pools up on the 31st floor, I can't. Just imagine the view! (Limited only to those who can open their eyes underwater, mind you. Or those who don't fear social ostracization as a result of goggle-wearing.) Yes, I know Toronto seems to have a wee (read: awful) problem with glass falling out of the sky, but I should hope that E Condos is taking every necessary precaution, especially will all of this pool-centric attention. Without a doubt, this development has location on its side. Whether you're a "Young and Eligible" fan or not, you can't deny that everything will be within seconds of the two new structures. There's grocery shopping and a movie theatre across the street, lots of bar and restaurant options right down the road, and a (proposed) underground connection to the subway and (to-be-constructed) Eglinton LRT. Residents will basically never have to go outside, not even have to leave their building to work out or go for a swim, and be able to bask in the satisfaction of having everything at their footsteps while maintaining a midtown address. It'll be Yonge and Dundas without the Ryerson kids or people handing out Jesus pamphlets. And perhaps this is redundant, but I think the view (this time, from the suites) merits another touting. While some units boast a measly 17 square feet in balcony space (why not just a closet?) others come with wrap-around balconies totaling 257 square feet. Seeing as this is not downtown Toronto with a skyscraper ending every block, you might actually be treated to a great scene outside your bedroom window. Cost. Can I say that again? Don't let the "Starting At..." or inoffensive $0.52 /sq. ft. maintenance fees fool you. You're going to pay for a unit at E Condos. While you may still be able to snag a unit for under $300k, you're undoubtedly going to get one that's under 500 square feet. Considerably so. Depending on the unit, you're looking at paying somewhere between $650 and $700 per square foot in either building, which is not chump change for us non-venture-capitalist types. And call me a pessimist if you like, but with E Condos' incredible list of amenities, I have a nagging suspicion that maintenance fees won't stay at $0.52 /sq. ft. for too long. The units themselves are somewhat underwhelming. Though they boast all of the now-obligatory double paned sealed windows, energy-efficient appliances, and nine-foot ceilings, the floor plans leave much to be desired. There is a noticeable lack of counter space in almost every unit, and the bedrooms boast barely enough room for a nightstand (nevermind two). I suppose such are the symptoms of a plan that turns a 734 square foot space into a 2-bed+den unit. In short, the suites are small. Better make good use of that yoga studio. 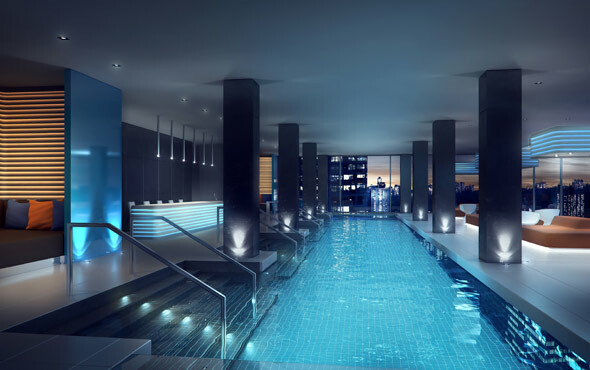 I'd very much like an affluent friend to purchase an E Condo suite and subsequently invite me over for an eFinity swim. I'll even bring the goggles. While there are surely those who would trade extra living space for fantastic amenities and a super-accessible location, I'm not one of them. With E Condos poised to bring a cool 1,000 people (though likely, many more) to the intersection in the next five years, the eligible at Yonge and Eglinton will get that much more competition. I think I'll sit this one out.